A rotating ice circle over Liaohe River in Faku County of north China's Liaoning Province has attracted hundreds of visitors on January 1. 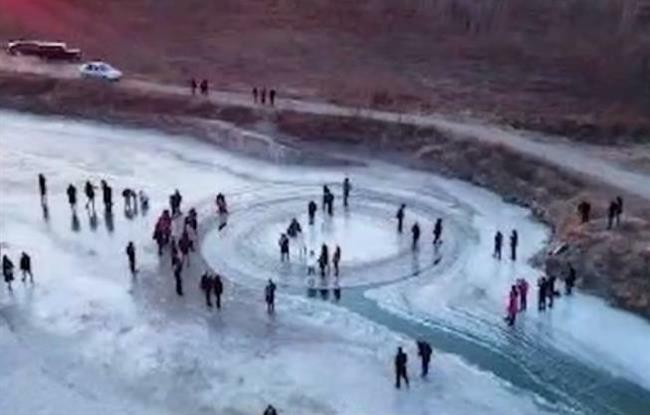 A rotating ice circle over Liaohe River in Faku County of north China’s Liaoning Province has attracted hundreds of visitors since it was discovered this week, according to The Paper. The circle looks extremely round — like a watch surface from an aerial view — and is surrounded with frozen and solid ice as it rotates at a constant speed on the river. It can still rotate with dozens of people standing on it, which has been tested out since becoming an attraction over the past few days. According to scientific research, the phenomena is sometimes seen in the North Pole, Scandinavia or Canada. The accelerated river flow can trigger rotational shear force, cutting the ice free and making it rotate slowly. The round shape is formed by friction.